Tranan (Skara Sommarland) New S&S Coaster Concept : Theme Park News & Construction! 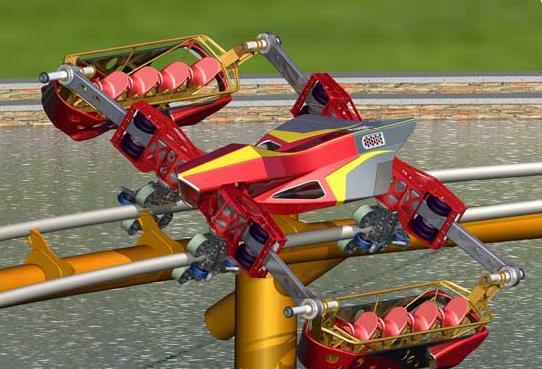 Later this year S&S created a new concept called the "Free-fly" roller coaster. As S&S does with many of their rides, they build prototypes at their factory in Utah, no exception for this ride, and a link to a video of the ride in action can be seen below. Skara Sommarland has decided to oreder the first ever Free-fly coaster, and it will be installed for the 2009 season at the park in Sweden. Below, you can see a video of the animation for the roller coaster Tranan going in at Skara Sommarland for 2009! Click here for a video of the Free-Fly coaster in action as a prototype at the S&S Factory in Utah. As the original innovators of the first vertical tower rides, S&S has now installed over 150 major amusement rides and coasters and more than 200 children's rides around the globe in 29 different countries. A company-wide commitment to providing world-class customer support has generated a reputation for excellence in the industry and numerous repeat customers. S&S is dedicated to supplying safe, top-quality rides to amusement park sites seeking to boost attendance by offering exceptional ride experiences to their guests. Last edited by Austin on December 9th, 2008, 10:33 pm, edited 1 time in total. Looks like an interesting concept. I'm sure it will be fun to ride because of the interesting movement around the rolls. i think that looks sweet! In the animation, the track is clearly heartlined.... is that not a slightly pointless endeavour? Your face is a pointless endeavor. Oh! Zing! Could be. You'd think so. Actually, I don't think it is. Maybe they want the center of the rotation to be at a certain point to allow for more uniform experiences by either side of the car? Meh, whatever, the ride looks sweet. I don't remember where I saw this before, but I saw it somewhere else and was like cool. They could do so much with this concept once they extend it beyond a family ride. you have to remember that also the lower Gs on the car, the better as well. Because we are squishy, we can take it, that thing is rigid and is gonna wear down faster than us if aplied to different mounts of force in all directions. and i freaking love this idea, it is excellence in a bottle. when does construction start? Wow it looks like a ride where they purposely designed many things to go wrong... I predict bad reliability! Who says a ride has to have inversions to be crazy? There are plenty examples of crazy rides I can think of that "don't even go upside down" but are still neat-looking rides. This is one of them, too. I am lovingg this design, IMO it looks like it has a lot of air time with that car design. S&S really are pushing the boundries of design, they really do think outside of the box. how do you see a coaster?????? ?